The rooftop vegetable seeds were started last Saturday. 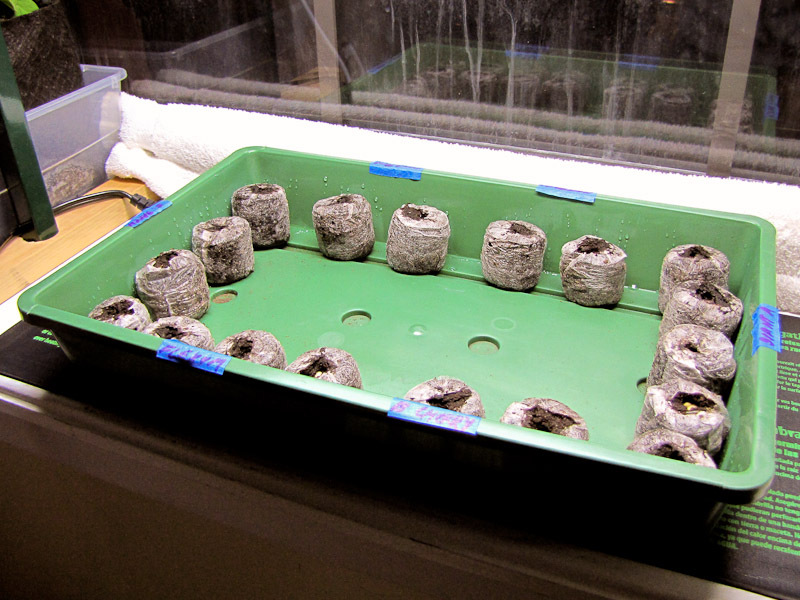 The indoor carrots were moved to the side so that the only thing under the grow light is the seed starting dome. Seeds don't need light at this stage of growth, but I have other vegetable plants growing on the windowsill so it's staying on. The heat mat is on a timer, it comes on at 8pm and turns off at 8am. Sunlight provides enough warmth during the day. They're too small to photograph, but I can see some seeds have already sprouted. As plants expire, or I get sick of eating whatever they produce, I'll replace them with root vegetables or peas for a fall harvest. Notice I'm growing 5 pots of flowers. I'm not growing them for aesthetic reasons, these flowers will be used to attract beneficial insects to the rooftop. I'll get into this in a later post. Above is my tentative planting schedule. If it warms up sooner I'll cut a week or two off the schedule. How is your seed starting going? Can I ask where you got your containers from? The ones with the tall lids? I've been looking for one like that. I started my seed in the beginning of March, and I think I started them too soon. They are growing really well but I have them in the 72 cell trays, and I'm afraid to put them outside. I'm in Yonkers, not far from you. Do you think they would die if I put them out? 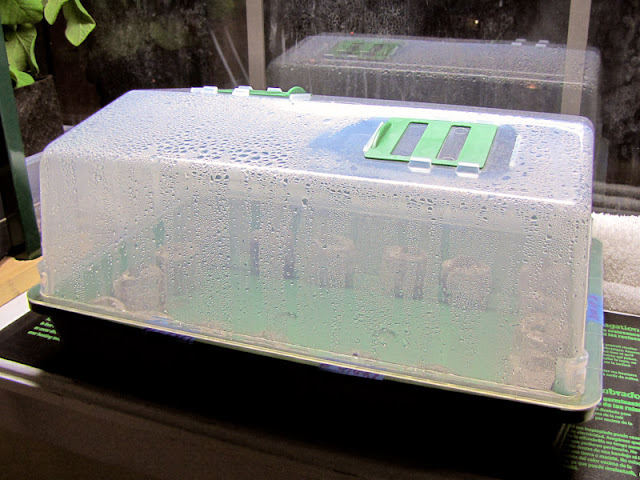 I bought this seed starting dome years ago from parkseed.com but if I had to do again I would just buy some clear plastic tote to use as a small greenhouse. If it's warm enough during the day, I would let them get a few hours of direct sunlight outside, but I wouldn't leave them out overnight. plants? I'd love to try them after reading how much success you had last year. Thanks for the articles on converting containers to SIPs — I'm planning to do something similar for two large ceramic containers I have. I'm having great luck this year with zucchini (http://gardenonthree.blogspot.com/2012/04/zucchini-transplants.html) and micro greens, I'm hopeful on peppers, and direct-sowed radishes and beets to Earthboxes. Glad I could help, hope you have a great growing season!